A copy of each of the annual, semi-annual, and interim account statements is available upon request. Welcome to Pershing Square Holdings, Ltd.
Users of this website are responsible for observing all applicable laws and regulations in their relevant jurisdictions before proceeding to access the information contained herein. By proceeding to access the information, users are deemed to have represented and warranted that the applicable laws and regulations of their relevant jurisdiction allow them to do so. No information contained on this website constitutes or would be deemed to constitute an invitation in any jurisdiction to invest or otherwise deal in the shares of the Company. None of the information contained in this website constitutes an offer to sell, or a solicitation of an offer to buy or subscribe for, any shares or other securities to the public. None of the information contained in this website constitutes an offer to sell, or a solicitation of an offer to buy or subscribe for, any shares or other securities in the United States or in any other jurisdiction, nor shall it, or the fact of its distribution, form the basis of, or be relied upon, in connection with or act as an inducement to enter into any contract or commitment therefor. Shares may not be purchased by an “employee benefit plan” within the meaning of the U.S. Employee Retirement Income Security Act of 1974, as amended (“ERISA”), including (i) an investor using assets of: (A) an “employee benefit plan” as defined in Section 3(3) of ERISA that is subject to Title I of ERISA; (B) a “plan” as defined in Section 4975 of the U.S. Internal Revenue Code, as amended (the “IRC”), including an individual retirement account or other arrangement that is subject to Section 4975 of the IRC; or (C) an entity which is deemed to hold the assets of any of the foregoing types of plans, accounts or arrangements that is subject to Title I of ERISA or Section 4975 of the IRC. The Company has not been and will not be registered under the U.S. Investment Company Act of 1940, as amended (the “Investment Company Act”), and investors will not be entitled to the benefits of that Act. In addition, the shares in the Company have not been and will not be registered under the U.S. Securities Act of 1933, as amended (the “Securities Act”). Consequently, shares in the Company may not be offered, sold or otherwise transferred within the United States or to, or for the account or benefit of, “U.S. persons” as defined in Regulation S under the Securities Act absent registration or an exemption from registration under the Securities Act. No public offering of any shares in the Company is being, or has been, made in the United States. The Company is a registered closed-ended investment scheme registered pursuant to the Protection of Investors (Bailiwick of Guernsey) Law, 1987, as amended and the Registered Collective Investment Scheme Rules 2008 issued by the Guernsey Financial Services Commission (the “Commission”). The Commission has not reviewed this disclaimer and takes no responsibility for the financial soundness of the Company or for the correctness of any of the statements made or opinions expressed with regard to it. All investment is subject to risk. The value of the shares in the Company may go down as well as up. Past performance is no guarantee of future returns and there is no guarantee that the market price of the Company’s shares will fully reflect their underlying net asset value. There is also no guarantee that the Company’s investment objective will be achieved. Potential investors are advised to seek expert financial advice before making any investment decision and should be aware that they may not fully recover the amount invested. A prospectus has been prepared in connection with the admission of the shares in the Company to listing and trading on Euronext in Amsterdam, the regulated market operated by Euronext Amsterdam N.V., and was approved by the Netherlands Authority for the Financial Markets (the “AFM”) on 2 October 2014 (the “Prospectus”). A Dutch supplement to the Prospectus has been prepared which contains specific information for retail investors in the Company in the Netherlands (the “Supplement”). The Prospectus and the Supplement are available on this website. Neither the Company nor Pershing Square Capital Management, L.P. (“PSCM”), the investment manager of the Company, assumes any obligation to update the information contained in the Prospectus or the Supplement thereto, unless a new offering in the Company will be undertaken. The information on this website is for information purposes only. Unless specifically stated otherwise, it does not constitute an offer to purchase or sell any security or investment product, nor does it constitute professional advice. Any product and service mentioned in this website are not offered to any person or entity in any jurisdiction or country where the advertisement, offer, solicitation, provision or sale of such product and service is restricted or prohibited by law or regulation or where PSCM or the Company or any of their respective affiliates would be subject to any regulation or licensing requirement. If you proceed to access the information included in this website, you acknowledge that you have read and agree with the above statement. Nothing in this website is, or should be relied on as, a promise or representation as to the future. This website contains forward-looking statements, which reflect the views of the Company and PSCM with respect to, among other things, the Company’s operations. Investors can identify these forward-looking statements by the use of words such as “believe”, “expect”, “potential”, “continue”, “may”, “will”, “should”, “seek”, “approximately”, “predict”, “intend”, “plan”, “estimate”, “anticipate” or other comparable words. These forward-looking statements are subject to various risks, uncertainties and assumptions. Accordingly, there are or will be important factors that could cause actual outcomes or results to differ materially from those indicated in these statements. Should any assumptions underlying the forward-looking statements contained on this website prove to be incorrect, the actual outcome or results may differ materially from outcomes or results projected in these statements. None of the Company, PSCM or any of their respective affiliates undertakes any obligation to update or review any forward-looking statement, whether as a result of new information, future developments or otherwise, except as required by applicable law or regulation. Copyright of all images and text in this website is owned by or licensed to PSCM, the Company or one of their respective affiliates unless otherwise noted. You may imprint, copy download or temporarily store extracts from this website for your personal information and use. You may not alter or otherwise make any changes to any material that you print or download from this website, including, without limitation, removing any identifying marks or legends from such material. You may not distribute these materials to others. Any other use is prohibited unless you first request and obtain our written permission. In particular no one may copy or use a part of the website on any other website, or link any other website to this website, without the prior written permission of PSCM and the Company. You may not use the website for any purpose which is unlawful, abusive, libelous, obscene or threatening. All trademarks, service marks and logos used on this website are trademarks or service marks or registered trademarks or service marks of either the Company, PSCM, their respective affiliates or their associates and service providers and should not be copied, altered or abused in any way. Although each of the Company and PSCM has taken all reasonable care to ensure that the information contained within this website is accurate no representation or warranty (including liability towards third parties), expressed or implied, is made as to its accuracy, reliability or completeness by the Company, PSCM, their respective affiliates and third parties that have provided information contained in this website. Opinions and any other contents expressed on this website are provided for your personal use and informational purposes only and are subject to change without notice. Nothing contained on this website constitutes investment, legal, tax or other advice and is not to be relied on in making an investment or other decision. You should obtain relevant and specific professional advice before making any investment decision. The information and opinions contained in this website are provided without any warranty of any kind, either expressed or implied, to the fullest extent permissible pursuant to applicable law. None of the Company, PSCM or any of their respective affiliates further assumes any responsibility for, and makes any warranties that, information and supplies contained on this website will be uninterrupted or error-free, that defects will be corrected, or that this website or the servers that make it available will be free of viruses or other harmful components. You agree that under no circumstances, including, but not limited to, negligence, shall the Company or PSCM or any third party that has provided information contained in this website or any of their respective affiliates be liable for any direct, special or consequential damages that result from the access or use of, or the inability to access or use, the materials on this website. This does not exclude or restrict any duty or liability the Company or PSCM has to its customers under the regulatory system in the Netherlands or Guernsey. Neither the Company nor PSCM has reviewed any website linked to this website and neither the Company nor PSCM is responsible for the contents of off-site pages or any other websites linked or linking to this website. If you follow any links off this website you do so at your own risk. Links to this website may not be established without the prior written consent of the Company and PSCM. 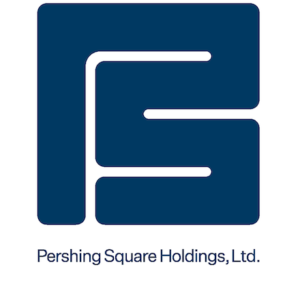 This is the Privacy Statement of the Pershing Square Holdings, Ltd. website and is intended to set out an explanation of what we do with any personal information provided to us by users of this website. The Privacy Statement is a statement of policy and, save for those rights and obligations set out in the Data Protection (Bailiwick of Guernsey) Law, 2001, it does not establish or create any additional user rights or any further obligations. No personal information is requested, collected, required or monitored in respect of access to the site’s home page or other pages giving general information about the Company or PSCM. Only limited personal information is required, collected and monitored and then only in respect of the Company. Such personal information will be held and processed by the Company in accordance with the Data Protection (Bailiwick of Guernsey) Law, 2001. The information requested for registration at dev-pershing-square-holdings.pantheonsite.io will only be used for internal purposes. The procedures covering the security and confidentiality, storage and disclosure of personal information provided to the Company by users of this site comply with the Data Protection (Bailiwick of Guernsey) Law, 2001. The use of the internet to transfer information is not secure. While we do our best to maintain security within our website and to safeguard your personal information, we cannot ensure or warrant the security of any information which you may transmit to us. Although each of the Company and PSCM tries to make this site as accurate as possible and to use information obtained from other sources that the Company and PSCM believe to be reliable, each of the Company and PSCM does not guarantee, nor take any responsibility for, its accuracy. The fact that information, products or services are shown on this website does not necessarily mean that you should rely on the information or that the information continues to be valid. All documents have their own shelf life and may be included on this website for historical reference purposes only. © 2019 Pershing Square Capital Management, L.P.